Key preliminary findings on the 2014 Gaza Conflict by a high level international military group as submitted to the UN Human Rights Council’s Commission of Inquiry, which is expected to issue its report next week. From 18th – 22nd May 2015, the High Level International Military Group, made up of 11 former chiefs of staff, generals, senior officers, political leaders and officials from the United States, Germany, the United Kingdom, Holland, Spain, Italy, Australia and Colombia visited Israel for a fact-finding mission on the 2014 Gaza conflict. 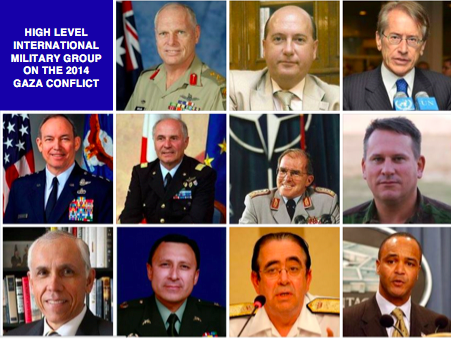 We were led by General Klaus Naumann, former Chief of Staff of the Bundeswehr and Chairman of the NATO Military Committee, the most senior officer in the Alliance, and Giulio Terzi, former Foreign Minister of Italy. Also in the group were Ambassador Pierre-Richard Prosper, formerly US State Department Ambassador at Large for war crimes issues; and Mr Rafael Bardaji, former National Security Adviser to the Government of Spain. This was part of a longer term project by our group, whose principal concern is how civilian lives can be protected and military forces can fight effectively when operations must be conducted in a densely packed civilian area. We will be producing a full report this autumn. Our mission to Israel was unprecedented. We were the first such multi-national group of senior officers to visit the country. We were granted a level of access to the Israeli government and Defence Force that has not been afforded to any other group, from the Prime Minister, Benjamin Netanyahu, and the Minister of Defence, Moshe Ya’alon, right down to the field commanders responsible for fighting the battle on the ground. We were well aware of the allegations made by some governments, the United Nations, human rights groups and the media, that Israel acted outside the laws of armed conflict in Gaza. Some have suggested that the IDF lacked restraint or even deliberately targeted innocent civilians. Our findings lead us to the opposite conclusion. We examined the circumstances that led to the tragic conflict last summer and are in no doubt that this was not a war that Israel wanted. In reality Israel sought to avoid the conflict and exercised great restraint over a period of months before the war when its citizens were targeted by sporadic rocket attacks from Gaza. Once the war had begun, Israel made repeated efforts to terminate the fighting. The war that Israel was eventually compelled to fight against Hamas and other Gaza extremists was a legitimate war, necessary to defend its citizens and its territory against sustained attack from beyond its borders. In the main Hamas’s rocket attacks deliberately and indiscriminately targeted Israeli civilian population centres in the south of the country. We visited one, the kibbutz Nahal Oz, at which more than 150 Hamas rockets had been directed last summer, causing loss of life and large-scale destruction. Many attacks were also launched against major cities further north including Jerusalem and Tel Aviv. Hamas deliberately fired missiles at Ben Gurion International Airport, disrupting and threatening international civil air traffic. There is no doubt that all of these attacks constitute war crimes. Hamas also constructed an array of tunnels, using materials diverted from humanitarian supplies, which penetrated the border between Gaza and Israel, in many cases emerging close to civilian communities. We entered one such tunnel, which extended over two kilometres, terminating only a few hundred yards from a kibbutz and likely intended to eventually bore into the kibbutz itself. We can only conclude that these tunnels were designed, at least in part, to attack, kill and abduct Israeli civilians. This again constitutes a war crime. Hamas launched attacks against Israel from the heart of its own civilian communities in Gaza and positioned its munitions and military forces there also, including in schools, hospitals and mosques. As well as carefully documented IDF evidence of this, we have viewed international media footage confirming several cases and are aware of senior Hamas officials’ own claims to have used human shields. A recent report by the UN Secretary General confirmed that in some cases Hamas even used UN facilities for storing munitions and launching attacks. Again, these actions clearly amount to war crimes. The laws of armed conflict not only forbid the use of human shields but also demand that combatant forces ensure their civilians are physically evacuated from combat areas. Hamas made no effort to evacuate civilians; on the contrary, there are documented cases of them compelling civilians to remain in or return to places where they expected Israeli attacks to come. The Israel Defence Force employed a series of precautionary measures to reduce civilian casualties. Each of our own armies is of course committed to protecting civilian life during combat. But none of us is aware of any army that takes such extensive measures as did the IDF last summer to protect the lives of the civilian population in such circumstances. We were briefed on the IDF’s strict procedures and standards for confirming the validity of a military target and the presence or absence of civilians, and the stringent requirements for both military and legal authorisation to attack a target. We were briefed on some cases where the IDF declined to attack known military targets due to the presence of civilians, risking, and in some instances costing, Israeli lives. Measures taken to warn civilians included phone calls, SMS messages, leaflet drops, radio broadcasts, communication via Gaza-based UN staff and the detonation of harmless warning explosive charges, known as “knock on the roof”. Where possible the IDF sought also to give guidance on safe areas and safe routes. We were briefed on the IDF’s proportionality principles and calculations used in circumstances where an attack was likely to result in civilian deaths. We believe that in general Israeli forces acted proportionately as required by the laws of armed conflict and often went beyond the required legal principles of proportionality, necessity and discrimination. We were briefed in detail on Israel’s humanitarian efforts to reduce the suffering of the civilian population in Gaza. The measures taken were often far in excess of the requirements of the Geneva Conventions. They sometimes placed Israeli lives at risk. To an extent these steps also undermined the effectiveness of the IDF’s operations by pausing military action and thus allowing Hamas to re-group and replenish. Supplies provided to the civilian population by Israel were often commandeered by Hamas for military use. We understand that over 2,000 people died in Gaza during the conflict. In a population of approximately 1.8 million, over a 50-day period many would have died of causes unrelated to the fighting. We also know that some died when Hamas’s attacks against Israel went wrong, and a recently published report by Amnesty International asserts that Hamas murdered at least twenty-three people in Gaza during this period, and tortured dozens more. On the basis of close scrutiny of open source records as well as from secret intelligence, the IDF informed us that they assess that over half of those declared dead were combatants from Hamas and other groups that were engaged in the fighting – a figure higher than that commonly asserted by the UN, which takes its own assessment from Hamas sources. This nevertheless leaves a deeply concerning number of civilian deaths, perhaps around 1,000, many of whom were killed as a result of Israeli military action. We recognise that some of these deaths were caused by error and misjudgement as we mention below. But we also recognise that the majority of deaths were the tragic inevitability of defending against an enemy that deliberately carries out attacks from within the civilian population. We must therefore consider that Hamas and its terrorist associates, as the aggressors and the users of human shield, are responsible for the overwhelming majority of deaths in Gaza this summer. In war, as in all facets of life, mistakes are made, including errors of judgement, confusion and technical failure. Also individual soldiers sometimes act unlawfully, against military policy, rules of engagement and military law. All of this of course occurred among IDF forces in the Gaza conflict as it does in all military forces. We were extensively briefed by the IDF’s Military Advocate General and by other military lawyers. We have been informed that where transgressions and errors are alleged these cases are subject to rigorous, transparent investigation and if necessary criminal proceedings and punishment. The Israeli military legal system includes a number of robust checks and balances, on which we were briefed; including oversight by the country’s widely respected supreme civil judiciary. We agree with the Chairman of the US Joint Chiefs of Staff, General Martin Dempsey, who following the Pentagon’s fact-finding mission to Israel, went on record last November as saying that in the 2014 Gaza conflict, “Israel went to extraordinary lengths to limit collateral damage and civilian casualties”. Our overall findings are that during Operation Protective Edge last summer, in the air, on the ground and at sea, Israel not only met a reasonable international standard of observance of the laws of armed conflict, but in many cases significantly exceeded that standard. We saw clear evidence of this from the upper to the lower levels of command. A measure of the seriousness with which Israel took its moral duties and its responsibilities under the laws of armed conflict is that in some cases Israel’s scrupulous adherence to the laws of war cost Israeli soldiers’ and civilians’ lives. Giulio Terzi – former Foreign Minister of Italy. General Klaus Naumann – former Chief of Staff of the Bundeswehr and Chairman of the NATO Military Committee. General Vincenzo Camporini – former Chief of the Defence Staff of Italy. Ambassador Pierre-Richard Prosper – former US State Department Ambassador at Large for war crimes issues. Mr Rafael Bardaji – former National Security Adviser for the Spanish government. Lieutenant General David A Deptula – former Standing Joint Force Air Component Commander, United States Pacific Command. Major General Jim Molan – former Chief of Operations, Headquarters Multi National Force, Iraq and Commander of the Australian Defence College. Colonel Richard Kemp – former Commander of British Forces in Afghanistan. The project was sponsored by the Friends of Israel Initiative.